"Hay fever" redirects here. For the play, see Hay Fever (play). Allergic rhinitis, also known as hay fever, is a type of inflammation in the nose which occurs when the immune system overreacts to allergens in the air. Signs and symptoms include a runny or stuffy nose, sneezing, red, itchy, and watery eyes, and swelling around the eyes. The fluid from the nose is usually clear. Symptom onset is often within minutes following exposure and they can affect sleep, the ability to work, and the ability to concentrate at school. Those whose symptoms are due to pollen typically develop symptoms during specific times of the year. Many people with allergic rhinitis also have asthma, allergic conjunctivitis, or atopic dermatitis. Allergic rhinitis is typically triggered by environmental allergens such as pollen, pet hair, dust, or mold. Inherited genetics and environmental exposures contribute to the development of allergies. Growing up on a farm and having multiple siblings decreases the risk. The underlying mechanism involves IgE antibodies attaching to the allergen and causing the release of inflammatory chemicals such as histamine from mast cells. Diagnosis is usually based on a medical history in combination with a skin prick test or blood tests for allergen-specific IgE antibodies. These tests, however, are sometimes falsely positive. The symptoms of allergies resemble those of the common cold; however, they often last for more than two weeks and typically do not include a fever. Exposure to animals in early life might reduce the risk of developing allergies to them later. A number of medications may improve symptoms including nasal steroids, antihistamines such as diphenhydramine, cromolyn sodium, and leukotriene receptor antagonists such as montelukast. Medications are, however, not sufficient or are associated with side effects in many people. Exposing people to larger and larger amounts of allergen, known as allergen immunotherapy, is often effective. The allergen may be given as injections just under the skin or as a tablet under the tongue. Treatment typically lasts three to five years after which benefits may be prolonged. Allergic rhinitis is the type of allergy that affects the greatest number of people. In Western countries, between 10–30% of people are affected in a given year. It is most common between the ages of twenty and forty. The first accurate description is from the 10th century physician Rhazes. 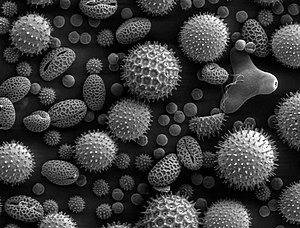 Pollen was identified as the cause in 1859 by Charles Blackley. In 1906, the mechanism was determined by Clemens von Pirquet. The link with hay came about due to an early (and incorrect) theory that the symptoms were brought about by the smell of new hay. The characteristic symptoms of allergic rhinitis are: rhinorrhea (excess nasal secretion), itching, sneezing fits, and nasal congestion and obstruction. Characteristic physical findings include conjunctival swelling and erythema, eyelid swelling, lower eyelid venous stasis (rings under the eyes known as "allergic shiners"), swollen nasal turbinates, and middle ear effusion. There can also be behavioural signs; in order to relieve the irritation or flow of mucus, people may wipe or rub their nose with the palm of their hand in an upward motion: an action known as the "nasal salute" or the "allergic salute". This may result in a crease running across the nose (or above each nostril if only one side of the nose is wiped at a time), commonly referred to as the "transverse nasal crease", and can lead to permanent physical deformity if repeated enough. People might also find that cross-reactivity occurs. For example, someone allergic to birch pollen may also find that he/she has an allergic reaction to the skin of apples or potatoes. A clear sign of this is the occurrence of an itchy throat after eating an apple or sneezing when peeling potatoes or apples. This occurs because of similarities in the proteins of the pollen and the food. There are many cross-reacting substances. Hay fever is not a true fever, meaning it does not cause a core body temperature in the fever over 37.5–38.3 °C (99.5–100.9 °F). Trees: such as pine (Pinus), birch (Betula), alder (Alnus), cedar (Cedrus), hazel (Corylus), hornbeam (Carpinus), horse chestnut (Aesculus), willow (Salix), poplar (Populus), plane (Platanus), linden/lime (Tilia), and olive (Olea). In northern latitudes, birch is considered to be the most common allergenic tree pollen, with an estimated 15–20% of people with hay fever sensitive to birch pollen grains. A major antigen in these is a protein called Bet V I. Olive pollen is most predominant in Mediterranean regions. Hay fever in Japan is caused primarily by sugi (Cryptomeria japonica) and hinoki (Chamaecyparis obtusa) tree pollen. "Allergy friendly" trees include: ash (female only), red maple, yellow poplar, dogwood, magnolia, double-flowered cherry, fir, spruce, and flowering plum. Grasses (Family Poaceae): especially ryegrass (Lolium sp.) and timothy (Phleum pratense). An estimated 90% of people with hay fever are allergic to grass pollen. Allergy testing may reveal the specific allergens to which an individual is sensitive. Skin testing is the most common method of allergy testing. This may include a patch test to determine if a particular substance is causing the rhinitis, or an intradermal, scratch, or other test. Less commonly, the suspected allergen is dissolved and dropped onto the lower eyelid as a means of testing for allergies. This test should be done only by a physician, since it can be harmful if done improperly. In some individuals not able to undergo skin testing (as determined by the doctor), the RAST blood test may be helpful in determining specific allergen sensitivity. Peripheral eosinophilia can be seen in differential leukocyte count. Allergy testing can either show allergies that are not actually causing symptoms or miss allergies that do cause symptoms. The intradermal allergy test is more sensitive than the skin prick test but is more often positive in people that do not have symptoms to that allergen. Even if a person has negative skin-prick, intradermal and blood tests for allergies, he/she may still have allergic rhinitis, from a local allergy in the nose. This is called local allergic rhinitis. Specialized testing is necessary to diagnose local allergic rhinitis. Allergic rhinitis may be seasonal or perennial. Seasonal allergic rhinitis occurs in particular during pollen seasons. It does not usually develop until after 6 years of age. Perennial allergic rhinitis occurs throughout the year. This type of allergic rhinitis is commonly seen in younger children. Allergic rhinitis may also be classified as Mild-Intermittent, Moderate-Severe intermittent, Mild-Persistent, and Moderate-Severe Persistent. Intermittent is when the symptoms occur <4 days per week or <4 consecutive weeks. Persistent is when symptoms occur >4 days/week and >4 consecutive weeks. The symptoms are considered mild with normal sleep, no impairment of daily activities, no impairment of work or school, and if symptoms are not troublesome. Severe symptoms result in sleep disturbance, impairment of daily activities, and impairment of school or work. Local allergic rhinitis is an allergic reaction in the nose to an allergen, without systemic allergies. So skin-prick and blood tests for allergy are negative, but there are IgE antibodies produced in the nose that react to a specific allergen. Intradermal skin testing may also be negative. The symptoms of local allergic rhinitis are the same as the symptoms of allergic rhinitis, including symptoms in the eyes. Just as with allergic rhinitis, people can have either seasonal or perennial local allergic rhinitis. The symptoms of local allergic rhinitis can be mild, moderate, or severe. Local allergic rhinitis is associated with conjunctivitis and asthma. In one study, about 25% of people with rhinitis had local allergic rhinitis. In several studies, over 40% of people having been diagnosed with nonallergic rhinitis were found to actually have local allergic rhinitis. Steroid nasal sprays and oral antihistamines have been found to be effective for local allergic rhinitis. Prevention includes avoiding the allergen in question. Other methods include not having pets, not having carpets in the home, and keeping the home dry. Growing up on a farm and having many older brothers and sisters decreases the risk. The goal of rhinitis treatment is to prevent or reduce the symptoms caused by the inflammation of affected tissues. Measures that are effective include avoiding the allergen. Intranasal corticosteroids are the preferred medical treatment for persistent symptoms, with other options if this is not effective. Second line therapies include antihistamines, decongestants, cromolyn, leukotriene receptor antagonists, and nasal irrigation. Antihistamines by mouth are suitable for occasional use with mild intermittent symptoms. Mite-proof covers, air filters, and withholding certain foods in childhood do not have evidence supporting their effectiveness. Antihistamine drugs can be taken orally and nasally to control symptoms such as sneezing, rhinorrhea, itching, and conjunctivitis. It is best to take oral antihistamine medication before exposure, especially for seasonal allergic rhinitis. In the case of nasal antihistamines like azelastine antihistamine nasal spray, relief from symptoms is experienced within 15 minutes allowing for a more immediate 'as-needed' approach to dosage. There is not enough evidence of antihistamine efficacy as an add-on therapy with nasal steroids in the management of intermittent or persistent allergic rhinitis in children, so its adverse effects and additional costs must be considered. Ophthalmic antihistamines (such as azelastine in eye drop form and ketotifen) are used for conjunctivitis, while intranasal forms are used mainly for sneezing, rhinorrhea, and nasal pruritus. Antihistamine drugs can have undesirable side-effects, the most notable one being drowsiness in the case of oral antihistamine tablets. First-generation antihistamine drugs such as diphenhydramine cause drowsiness, while second- and third-generation antihistamines such as cetirizine and loratadine are less likely to. Pseudoephedrine is also indicated for vasomotor rhinitis. It is used only when nasal congestion is present and can be used with antihistamines. In the United States, oral decongestants containing pseudoephedrine must be purchased behind the pharmacy counter in an effort to prevent the manufacturing of methamphetamine. Intranasal corticosteroids are used to control symptoms associated with sneezing, rhinorrhea, itching, and nasal congestion. Steroid nasal sprays are effective and safe, and may be effective without oral antihistamines. They take several days to act and so must be taken continually for several weeks, as their therapeutic effect builds up with time. In 2013, a study compared the efficacy of mometasone furoate nasal spray to betamethasone oral tablets for the treatment of people with seasonal allergic rhinitis and found that the two have virtually equivalent effects on nasal symptoms in people. Systemic steroids such as prednisone tablets and intramuscular triamcinolone acetonide or glucocorticoid (such as betamethasone) injection are effective at reducing nasal inflammation, but their use is limited by their short duration of effect and the side-effects of prolonged steroid therapy. Other measures that may be used second line include: decongestants, cromolyn, leukotriene receptor antagonists, and nonpharmacologic therapies such as nasal irrigation. Topical decongestants may also be helpful in reducing symptoms such as nasal congestion, but should not be used for long periods, as stopping them after protracted use can lead to a rebound nasal congestion called rhinitis medicamentosa. For nocturnal symptoms, intranasal corticosteroids can be combined with nightly oxymetazoline, an adrenergic alpha-agonist, or an antihistamine nasal spray without risk of rhinitis medicamentosa. Nasal saline irrigation (a practice where salt water is poured into the nostrils), may have benefits in both adults and children in relieving the symptoms of allergic rhinitis and it is unlikely to be associated with adverse effects. Allergen immunotherapy (AIT, also termed desensitization) treatment involves administering doses of allergens to accustom the body to substances that are generally harmless (pollen, house dust mites), thereby inducing specific long-term tolerance. Allergy immunotherapy can be administered orally (as sublingual tablets or sublingual drops), or by injections under the skin (subcutaneous). Therapeutic efficacy of alternative treatments such as acupuncture and homeopathy is not supported by available evidence. Some evidence shows that acupuncture is effective for rhinitis, whereas other evidence does not. However, the overall quality of evidence is poor. Allergic rhinitis is the type of allergy that affects the greatest number of people. In Western countries, between 10 and 30 percent of people are affected in a given year. It is most common between the ages of twenty and forty. The first accurate description is from the 10th century physician Rhazes. Pollen was identified as the cause in 1859 by Charles Blackley. In 1906 the mechanism was determined by Clemens von Pirquet. The link with hay came about due to an early (and incorrect) theory that the symptoms were brought about by the smell of new hay. ^ a b "Environmental Allergies: Symptoms". NIAID. April 22, 2015. Archived from the original on 18 June 2015. Retrieved 19 June 2015. ^ a b c d e f g h i j k l m n Wheatley, LM; Togias, A (29 January 2015). "Clinical practice. Allergic rhinitis". The New England Journal of Medicine. 372 (5): 456–63. doi:10.1056/NEJMcp1412282. PMC 4324099. PMID 25629743. ^ a b c d e f g h "Cause of Environmental Allergies". NIAID. April 22, 2015. Archived from the original on 17 June 2015. Retrieved 17 June 2015. ^ a b c "Environmental Allergies: Diagnosis". NIAID. May 12, 2015. Archived from the original on 17 June 2015. Retrieved 19 June 2015. ^ a b "Environmental Allergies: Treatments". NIAID. April 22, 2015. Archived from the original on 17 June 2015. Retrieved 17 June 2015. ^ a b c d e "Immunotherapy for Environmental Allergies". NIAID. May 12, 2015. Archived from the original on 17 June 2015. Retrieved 19 June 2015. ^ a b Dykewicz MS, Hamilos DL (February 2010). "Rhinitis and sinusitis". The Journal of Allergy and Clinical Immunology. 125 (2 Suppl 2): S103–15. doi:10.1016/j.jaci.2009.12.989. PMID 20176255. ^ a b c d Fireman, Philip (2002). Pediatric otolaryngology vol 2 (4th ed.). Philadelphia, Pa.: W. B. Saunders. p. 1065. ISBN 9789997619846. ^ a b Colgan, Richard (2009). Advice to the young physician on the art of medicine. New York: Springer. p. 31. ISBN 9781441910349. Archived from the original on 2017-09-08. ^ a b Justin Parkinson (1 July 2014). "John Bostock: The man who 'discovered' hay fever". BBC News Magazine. Archived from the original on 31 July 2015. Retrieved 19 June 2015. ^ a b Hall, Marshall (May 19, 1838). "Dr. Marshall Hall on Diseases of the Respiratory System; III. Hay Asthma". The Lancet. 30 (768): 245. doi:10.1016/S0140-6736(02)95895-2. With respect to what is termed the exciting cause of the disease, since the attention of the public has been turned to the subject an idea has very generally prevailed, that it is produced by the effluvium from new hay, and it has hence obtained the popular name of hay fever. [...] the effluvium from hay has no connection with the disease. ^ a b History of Allergy. Karger Medical and Scientific Publishers. 2014. p. 62. ISBN 9783318021950. Archived from the original on 2016-06-10. ^ a b c d e f g Sur DK, Plesa M (1 December 2015). "Treatment of Allergic Rhinitis". Am Fam Physician. 92 (11): 985–992. Retrieved 21 April 2018. ^ Valet RS, Fahrenholz JM (2009). "Allergic rhinitis: update on diagnosis". Consultant. 49: 610–3. Archived from the original on 2010-01-14. ^ Pray, W. Steven (2005). Nonprescription Product Therapeutics. p. 221: Lippincott Williams & Wilkins. ISBN 978-0781734981. ^ Czaja-Bulsa G, Bachórska J (1998). "[Food allergy in children with pollinosis in the Western sea coast region]". Pol Merkur Lekarski. 5 (30): 338–40. PMID 10101519. ^ Yamamoto T, Asakura K, Shirasaki H, Himi T, Ogasawara H, Narita S, Kataura A (2005). "[Relationship between pollen allergy and oral allergy syndrome]". Nippon Jibiinkoka Gakkai Kaiho. 108 (10): 971–9. doi:10.3950/jibiinkoka.108.971. PMID 16285612. ^ Malandain H (2003). "[Allergies associated with both food and pollen]". Allerg Immunol (Paris). 35 (7): 253–6. PMID 14626714. ^ "Allergy Friendly Trees". Forestry.about.com. 2014-03-05. Archived from the original on 2014-04-14. Retrieved 2014-04-25. ^ Pamela Brooks (2012). The Daily Telegraph: Complete Guide to Allergies. ISBN 9781472103949. Retrieved 2014-04-27. ^ Denver Medical Times: Utah Medical Journal. Nevada Medicine. 2010-01-01. Archived from the original on 2017-09-08. Retrieved 2014-04-27. ^ George Clinton Andrews; Anthony Nicholas Domonkos (1998-07-01). Diseases of the Skin: For Practitioners and Students. Archived from the original on 2017-09-08. Retrieved 2014-04-27. ^ "Allergy Tests". Archived from the original on 2012-01-14. ^ a b Rondón, Carmen; Canto, Gabriela; Blanca, Miguel (2010). "Local allergic rhinitis: A new entity, characterization and further studies". Current Opinion in Allergy and Clinical Immunology. 10 (1): 1–7. doi:10.1097/ACI.0b013e328334f5fb. PMID 20010094. ^ a b c d Rondón, C; Fernandez, J; Canto, G; Blanca, M (2010). "Local allergic rhinitis: Concept, clinical manifestations, and diagnostic approach" (PDF). Journal of Investigational Allergology & Clinical Immunology. 20 (5): 364–71, quiz 2 p following 371. PMID 20945601. Archived (PDF) from the original on 2013-11-01. ^ "Rush University Medical Center". Archived from the original on 2015-02-19. Retrieved 2008-03-05. ^ Bousquet J, Reid J, van Weel C, et al. (August 2008). "Allergic rhinitis management pocket reference 2008". Allergy. 63 (8): 990–6. doi:10.1111/j.1398-9995.2008.01642.x. PMID 18691301. ^ Rondón C, Campo P, Galindo L, Blanca-López N, Cassinello MS, Rodriguez-Bada JL, Torres MJ, Blanca M (2012). "Prevalence and clinical relevance of local allergic rhinitis". Allergy. 67 (10): 1282–8. doi:10.1111/all.12002. PMID 22913574. ^ Flint, Paul W.; Haughey, Bruce H.; Robbins, K. Thomas; Thomas, J. Regan; Niparko, John K.; Lund, Valerie J.; Lesperance, Marci M. (2014-11-28). Cummings Otolaryngology - Head and Neck Surgery E-Book. Elsevier Health Sciences. ISBN 9780323278201. ^ "Prevention". nhs.uk. 3 October 2018. Retrieved 17 February 2019. ^ Nasser, M; Fedorowicz, Z; Aljufairi, H; McKerrow, W (7 July 2010). "Antihistamines used in addition to topical nasal steroids for intermittent and persistent allergic rhinitis in children". The Cochrane Database of Systematic Reviews (7): CD006989. doi:10.1002/14651858.CD006989.pub2. PMID 20614452. ^ a b c May, J.R.; Smith, P.H. (2008). "Allergic Rhinitis". In DiPiro, J.T. ; Talbert, R.L. ; Yee, G.C. ; Matzke, G.; Wells, B.; Posey, L.M. (eds.). Pharmacotherapy: A Pathophysiologic Approach (7th ed.). New York: McGraw-Hill. pp. 1565–75. ISBN 978-0071478991. ^ Karaki M, Akiyama K, Mori N (2013). "Efficacy of intranasal steroid spray (mometasone furoate) on treatment of patients with seasonal allergic rhinitis: comparison with oral corticosteroids". Auris Nasus Larynx. 40 (3): 277–81. doi:10.1016/j.anl.2012.09.004. PMID 23127728. ^ Ohlander BO, Hansson RE, Karlsson KE (1980). "A comparison of three injectable corticosteroids for the treatment of patients with seasonal hay fever". J Int Med Res. 8 (1): 63–9. doi:10.1177/030006058000800111. PMID 7358206. ^ Baroody FM, Brown D, Gavanescu L, Detineo M, Naclerio RM (2011). "Oxymetazoline adds to the effectiveness of fluticasone furoate in the treatment of perennial allergic rhinitis". The Journal of Allergy and Clinical Immunology. 127 (4): 927–34. doi:10.1016/j.jaci.2011.01.037. PMID 21377716. ^ Van Overtvelt L. et al. Immune mechanisms of allergen-specific sublingual immunotherapy. Revue française d’allergologie et d’immunologie clinique. 2006; 46: 713–720. ^ Passalacqua G, Bousquet PJ, Carlsen KH, Kemp J, Lockey RF, Niggemann B, Pawankar R, Price D, Bousquet J (2006). "ARIA update: I—Systematic review of complementary and alternative medicine for rhinitis and asthma". The Journal of Allergy and Clinical Immunology. 117 (5): 1054–62. doi:10.1016/j.jaci.2005.12.1308. PMID 16675332. ^ Terr A (2004). "Unproven and controversial forms of immunotherapy". Clin Allergy Immunol. 18 (1): 703–10. PMID 15042943. ^ Witt CM, Brinkhaus B (July 2010). "Efficacy, effectiveness and cost-effectiveness of acupuncture for allergic rhinitis — An overview about previous and ongoing studies". Autonomic Neuroscience. 157 (1–2): 42–5. doi:10.1016/j.autneu.2010.06.006. PMID 20609633. This page was last edited on 20 April 2019, at 01:59 (UTC).